Because these calling cards were found with a Maine collection of cards, many from the New Sharon, Maine, area, I believe these cards belonged to the Lewis Sawyer who was born in 1857 at New Sharon, Maine. 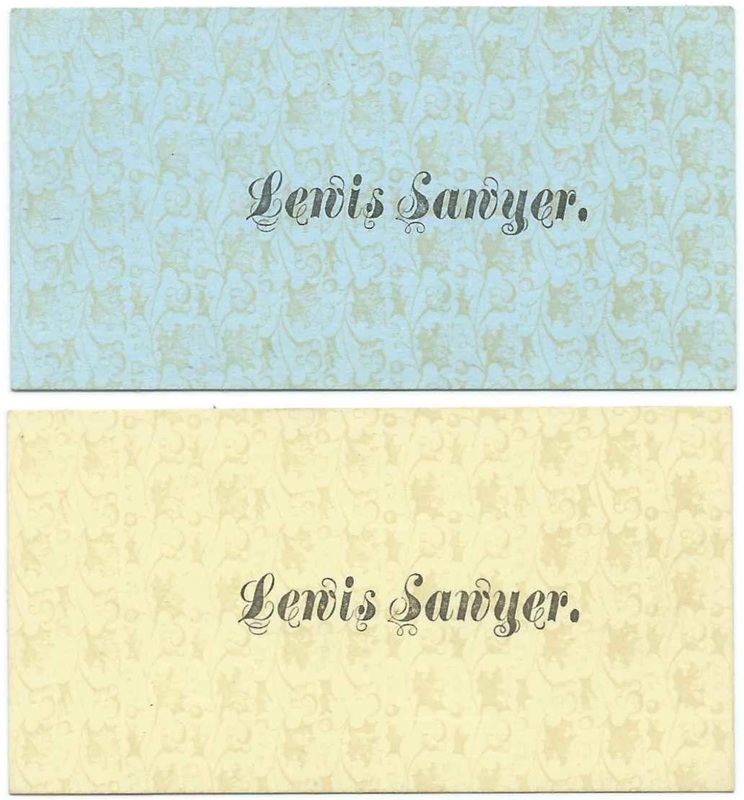 There was a Lewis Sawyer born at New Sharon, Maine, on March 12, 1857, the son of Thomas D. Sawyer and Hannah (Dyer) Sawyer, both of whom died when Lewis was young. At the time of the 1870 Census, Lewis was living with his widowed mother, who would herself die three years later, and siblings at Strong, Maine, in the household of Daniel Day. Lewis may have been the Lewis Sawyer working as a servant for farmers David and Susan Gordon of New Sharon, Maine, as shown in the 1880 Census. Could he have been the Lewis Sawyer, who gave his residence as Chesterville, Maine, when he married Mary E. Rome of Farmington, Maine, at Farmington on March 14, 1883? I couldn't find any other information about Mary, whether Rome was her birth surname or a previous husband's surname, or if Rome was a misprint for Rowe. Hopefully a reader will have information to share. There is Find-a-Grave memorial for a Lewis Sawyer and Mary Sawyer buried in the Blake Cemetery at Farmington Falls, Maine, and this Lewis was born in March, but on a different day. Perhaps the Maine birth records that give his Date of birth as March 12, 1857, were in error or delayed, or the date on the stone was inscribed incorrectly? Lots of questions... Hopefully a reader will come through with clarification. If you have corrections and/or additions to the information above, please leave a comment or contact me directly. Could be - wish Lewis had provided a middle initial. That said, though, most of the cards in the collection belonged to folks in Franklin and Somerset Counties.